Welcome to the fun and creative world of Swarovski Crystal Flatbacks! Not only are crystal rhinestones stunning, colorful and extremely versatile in sizes and styles, they are fun and easy to apply to just about any surface you can imagine. If you like to create and wear stunning sparkles, utilizing these beauties is a no-brainier! 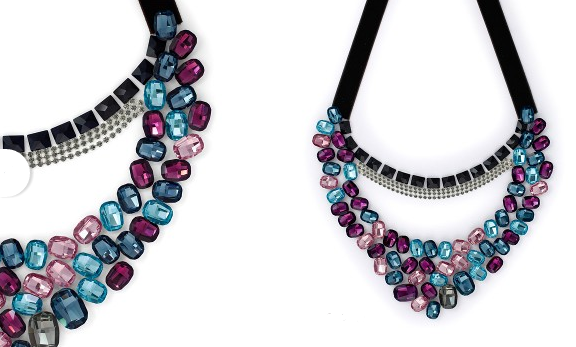 This gorgeous crystal necklace features a top row of the Swarovski 2520 Cosmic Flatbacks in Jet, accentuated by three rows of smaller round Swarovski 2088 Xirius Flatbacks in Black Diamond. The larger focal point is designed using the Swarovski 2585 Graphic Flatbacks in various sizes and colors such as Denim Blue, Aquamarine, Crystal Antique Pink, Amethyst and Black Diamond. 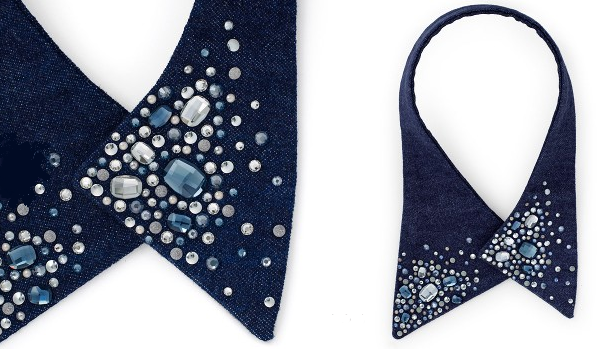 This adorably fashionable collar necklace features Swarovski Crystal Hot Fix Flatbacks that have glue that has been pre-applied to the back for easy application with a Bejeweler Pro Hot Fix Tool. The Swarovski Crystals include the 2078 XIRIUS Flatbacks Chalkwhite Hot Fix, White Opal Hot Fix, and Crystal Hot Fix, along with the 2080/4 Cabochon Crystal White Pearl Hot Fix, and the 2585 Graphic Flat Back Crystal Hot Fix. A black satin ribbon is tied onto the bottom for extra sweetness. The Swarovski Crystal Graphic family, consisting of Flat Backs, Fancy Stones and Pendants, reflect the global emphasis on individuality and the corresponding importance of modular families of products. This radiant clan is defined by an astonishingly versatile geometric cut—a cut that brilliantly addresses design’s current love affair with androgyny, as well as acknowledging the major trend for updated classics. Create designer fashions and accessories in seconds! The BeJeweler Pro Hot Fix Applicator allows you to embellish any porous item from many clothing options such as shirts, jeans and dresses to hats, purses and various accessories, flip flops, sandals, paper, gifts, costumes, wedding embellishments, invitations, picture frames, pet products and more! No need to use any additional glue, The BeJeweler Pro will pick up your Swarovski Hot Fix Flat Backs quickly and easily. Place the Rhinestone setter directly on top of the Swarovski Crystal Rhinestone and the heat activated glue on the back will adhere to the surface below. The sparkling interplay between rough and smooth faceting creates an attraction of opposites, giving timeless style a modern, organic twist and ensuring the longevity of the Graphic family’s appeal. Easily integrated into a variety of designs, the strength of its adaptability lies in its affordable pricing and its minimalist look—a feature that also makes this family of crystals ideal for using in unisex designs. The Crystal Katana Tool is a fabulous tool for applying Non Hot Fix crystals to surfaces using glue. The sticky end of the tool allows you to pick up the crystals simply and effectively place them into the glue. The metal end of the tool allows you to press the crystal gently into the glue for maximum hold and durability. I love using this brilliant tool, it is so much faster than beeswax or tweezers and there is no more mess or frustration when placing the crystals into the glue. It’s fabulous and I guarantee, you will love it too! 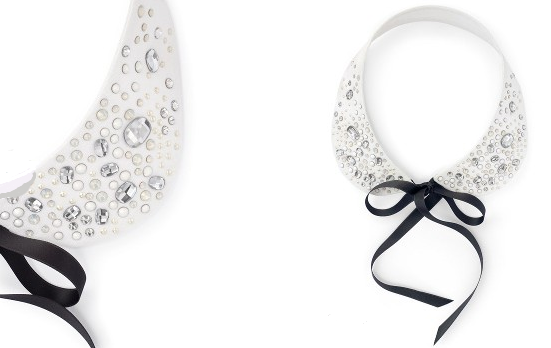 I hope these designs inspire you to create your own stylish collar necklaces that are embellished with as much or as little sparkle as your heart desires! This entry was posted in DIY and Resources, Jewelry Inspirations and tagged 2078 XIRIUS Flatbacks, 2080/4 Cabochon Crystal White Pearl Hot Fix, 2585 Graphic Flat Back Crystal Hot Fix, Amethyst, Aquamarine, Bejeweler Pro Hot Fix Tool, Black Diamond, Chalkwhite Hot Fix, Cheap Swarovski Crystals, Crystal Antique Pink, Crystal Hot Fix, Crystal Katana Tool, crystal necklace design inspiration, Denim Blue, Fancy Stones, Flat Backs, jet Flatbacks, jewelry design inspirations, Pendants, Swarovski 2088 Xirius Flatbacks, Swarovski 2520 Cosmic Flatbacks, Swarovski Crystal Flatbacks, Swarovski Crystal Rhinestones, Swarovski Crystals, SWAROVSKI ELEMENTS, White Opal Hot Fix, wholesale crystal beads, wholesale Swarovski crystal to the public, wholesale swarovski crystals, wholesale Swarovski Elements. Bookmark the permalink.